“In the not too distant future, wars will no longer exist. OK, so I’m showing my age, listening as a kid to early commercial radio in the UK. But how might all that have any relevance to this week’s puzzle? Initially there seemed to be too many of said plants from which to choose. However, given it appeared to need six letters and be a plural, then ANISES seemed a good bet. This is where I nearly went astray. I imagined ‘decorates’ to be ANODISES with one letter missing for the Grid Entry. But the gaps made it look like AODISES was to be the entry, so I put that in. It was only when double-checking the defining phrase of AN ENCLOSURE TO DRIVE HUNTED ANIMALS INTO, that I realised that it was the D that needed to be missing. And only then did I realise that the word defined by ‘decorates’ was ADONISES, with the D missing in the entry. That was a close shave, especially so early in 2019! 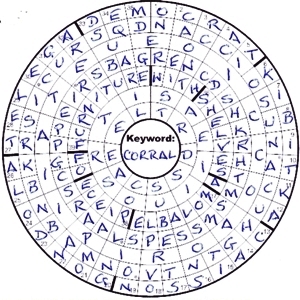 As someone who hasn’t been solving thematics for long, and there not being that many circular thematics amongst those, I did wonder initially if a solver could assume that ring-based answers are to be entered clockwise unless stated otherwise? I began by assuming not, so may have been unnecessarily complicating things. Luckily a few checked cells showed that – in this case at least – these were to be entered clockwise, so things got rolling again. … which I parsed as BIT inside KI(t)KA(t), with a separate instruction to delete each of the Ts – very neat! And the Title? ROLLER=Wagon plus BALL=Circle, with the film title bluff. Maybe? However, there was a lot going on, so it looked as though it would be interesting. Indeed it was. Most radials would go inwards, but seven (thanks for the info) would go outwards. Unfortunately, they all needed to lose a letter before entry and these letters would spell out a definition. The perimeter and Ring 5 were clued by wordplay only, but TaoH was kind in making most of them very straightforward. Although I quickly slotted CAISSON, GONDOLA and TELEGA into the perimeter, I failed to see what they might have in common. The first two had a watery connection and the last was a Russian wagon. A quick check in the BRB showed that they were all types of wagon. Fiddling around with the Radial clues took a fair amount of time, even though some were helpful. Sometime later and I had a few of the letters in Ring 5 such that I could solve its outstanding clues. Thus the definition was A MOVABLE PIECE OF FURNITURE WITH SHELVES. More failure to understand on my part, and it was some time before I looked up wagon in Chambers. The remaining two perimeter wagons were DEMOCRAT and KIBITKA. The latter was clued as Bit into chocolate bar, almost losing tip of tooth, leading to BIT in KITKA(t) – T. KitKat in the UK was originally made by Rowntree’s. That company was bought out by Nestlé which subsequently closed it. Typical!! In the USA it is made under licence by Reese, a division of the Hershey Company — so heaven knows what it tastes like! Finally, we had the letters dropped from the Radials giving An enclosure to drive hunted animals into and CORRAL soon went into the centre of the grid.